Thank you for joining us! We are excited to you see you at the event! The Wait is Over! Yes, this is the final pitching event! 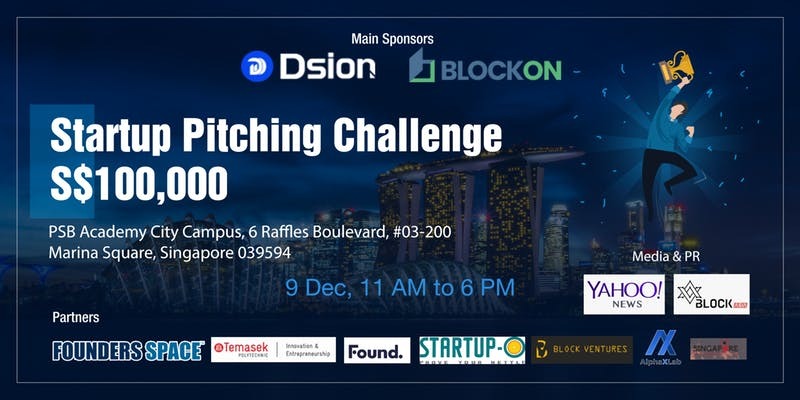 We are pleased to work with various startup partners (Block On, Dsion, Founders Space, Temasek Polytechnics Launchpad, Found, Startup-O, Block Ventures, AlphaXLab & SBM) from Singapore, Korea & Silicon Valley to make this event possible. If you just want to come down to support your favorite teams or network with Entrepreneurs, Startups Founders, Angel Investors & VCs from Singapore, this is the event you shouldn’t miss. Each team will be given 5 mins to pitch with 5 mins for Q&A to 200+ audience, including a judging panel of top entrepreneurs, investors and VCs. Your votes, as part of the audience, will be counted within the scoring for the top three winning prizes and also for Investor’s Choice & People’s Choice Award. We’ll also have Lucky Draw with many amazing vouchers & prizes as well. *S$100,000 is sum of cash winning prizes, incubation fund, MVP fund & Grant. SG Entrepreneur Grant is subjected to approval and it is applicable to 1st timer for Singaporean & PR only. More Investors/VCs will be added in soon. Note: Registration & Refreshments at 3rd floor main lobby area and The Event will be held at Lecture Theatre 4. 15:35 – 16:00 -> Panel Discussion – What do Investors/VCs look out for during Seed Funding? These are our partners for media coverage for the Final Pitching Event. More media will be added in soon. Jon Pil Seo is online IT Operations Specialist and CEO of Land Pro & Edu Pro. He has 15 years of experience in online business and expert in mining and cryptography. Temasek Polytechnic Innovation & Entrepreneurship Department (I&ED) is helmed by Mr Samuel Ang as the Director. Mr Ang is also instrumental in the setting up of Temasek Launchpad which was launched in Jul 2018 by the department. He is mentoring several startups, of which Qourier Pte Ltd and Schonell Pte Ltd, were both awarded the ACE Startup Grants. He has successfully helped Qourier Pte Ltd, a TP Startup, to secure the ACE Startup Grant and a subsequent pre-seed investment of $100,000. Qourier, a two and a half year old startup has since raised close to a total of $1 million. His entrepreneurial experience includes bringing his IT training startup from a 5 man operation to a regional technical training centre covering Singapore, Malaysia, Indonesia, Thailand and Philippines. It was since acquired by Mr Peter Lim “Remisier King” through one of his listed entity. Samuel went on to startup a leading MRO support company which was acquired by a Temasek Holdings subsidiary, Certis-CISCO. Samuel then went on to work as a new equity partner with the founders of two separate Singapore companies to secure their IPO and listing on SGX Catalist. He worked towards growing one of them as the COO, to achieve an annual operational revenue of approximately $500 million with annual growth at a greater than 20% CARG. Some of the companies Charlie founded/co-founded include a pre-2K tech start-up which attracted investment from a NASDAQ-listco, an Intellectual Property agency which saw expansion into Thailand, Japan, Vietnam & Malaysia, an Intellectual Property management, licensing and competitive intelligence outfit Allied Intuit, and F&B consulting outfit ARCSIS International (an ACE award recipient). In 2004, he led CRAVES and successfully received special features in newspapers, magazines and events, including a front page feature in the Straits Times and a top-ten Christmas services ranking in the inaugural issue of an SPH magazine. He was also engaged in medical robotics systems research with a local university and was part of the team that developed “the world’s first robot brain surgeon” (Herald Tribune), garnering several international research publications in the process. His technology background extends from being an inventor (voice recognition and proton-exchange membranes) to being a developer of OID coding & OID code recognition algorithms (offered the TECS award). IMDA). He was adjunct lecturer at the National University of Singapore 2003-2014), tutored at the Nanyang Technological University (early 2000) and is frequently invited as guest-speaker for various institutes of management and commerce. Investment banker turned entrepreneur, Thomas has extensive experience in the startup space both as investor and as entrepreneur. Passionate about startups and entrepreneurship, Thomas began investing in early stage ventures while working in banking, before embarking on a full-time career in venture investing and entrepreneurship more than a decade ago. Thomas co-founded Tradeworks, a SaaS-based algorithmic trading platform tailored for individuals in 2013. He has lived in SG with his family for the past 5 years where he has developed the Asian client franchise while also being responsible for all the company’s fundraising activities. An active business angel, Thomas has invested in and mentored multiple startups across the ICT space. Thomas is a Business Studies undergraduate from University of Westminster, London, and holds an executive MBA from Copenhagen Business School (CBS). Most recently Thomas joined FutureLabs.vc as a venture-builder working with their partner ING Bank. Finty is an online financial marketplace that was acquired by an Australian firm for a seven-figure sum, 15 months after the company was launched. Prior to helming business growth efforts at Finty, Zhong Li was the Vice President of eBusiness at OCBC Bank, heading up digital sales and performance management. His previous roles include Senior Manager, Digital Marketing & eCommerce at Trend Micro. He oversaw APAC online consumer business and developed digital ROI framework with advanced web analytics. He was also the Digital Marketing Lead at Yahoo! where he developed digital strategies, campaigns, and programs for SEA region. Andee Chua, Head of Community at Found. Andee is a skilled community builder, connector and collaborator. He is a social catalyst/agitator and believes in the importance of growth in people, both personally and professionally. He loves digging into the strategy of how to build and foster deeper relationships with various key communities within the startup ecosystem. His dedication to the startups he meets and his ability to challenge you to think out of the box really sets him apart. He has spent his time mentoring and advising early-stage startups, helping them eye for new opportunities and how to best get their voices out there. Following his previous stint as an international model and a marketing & branding lead for a local prop-tech startup, Andee has built a good reputation in the media industry & is one of the well sought-after power connector in the ecosystem. Irwin was at i-Sprint Innovations, a security tech firm. During his time, he helped launched more than fourteen products and went through two rounds of acquisitions. He was Co-founder at Rimu Group, a venture capital fund which invests across SEA, led rounds and co-invested along side other VCs such as Wavemaker Partners, Ardent Capital, SMDV, SPH, Fenox and DeNA. With a portfolio of 4 acquisitions and 2 exits, He was also General Manager responsible for business development and operations at Rockstagvid, a Singaporean video production firm and built 3 hyperlocal media assets that reaches 8,000,000 people monthly. Shiva is Founder/CEO of Varidus, a new paradigm on venture capital. Varidus helps technology startups scale not only via our own capital at a later stage but also raise capital from other means, scale via partnerships and reduce their operating costs via ancillary services. Varidus usually co-invests at a later stage in ventures in US/Europe and soon in SE Asia. Shiva holds top degrees with top honors from world-class universities like IIT, Purdue and MIT Sloan. He is also Recipient of two patents and numerous invention disclosures. Rahul manages multinational Group having interest in 8 Business Verticals, 44 Business Domains. Treasury Consulting Pte Ltd that owned Intellectual Property (IP) – www.fixedincome.global (World’s first Fixed Income Platform). It serves 75+ Global Clients, 100+ Domestic Clients. Covering Markets like United States, Canadian Financial Markets, European Union, Australia & New Zealand (ANZ), Asia Pacific Financial Markets, Japanese, OPEC, African & Indian Markets. Treasury Consulting awarded amongst Top 50 Internationally Growing Companies in India by IE 20, London Partners during April 2018. Treasury Consulting Pte Ltd managed $ 480 Billion Assets Under Management (AUM) under Private Placement Programs (PPP) Desk covering all Assets Classes like Letter of Credit (L/C), Bank Guarantees (BG), SBG, SBLC, DPLC and respective. Envisaged to have $ 1 Trillion Desk by Dec’19. He also holds more than decade experience as a Group Corporate Treasurer. Awarded amongst Top 20 Corporate Treasurers in 2014 by CFO India Institute. Won several CFO Awards during Corporate Career in EXL, HCL. Anuj is the co-founder & CEO of Startup-O which is South East Asia’s leading online platform for startup assessments, investment & venture building. He is driven by the vision of democratising innovation by enabling authentic entrepreneurs to succeed with a ‘Fast & Fair’ connect to strategic capital & global networks. Anuj has rich ‘Go To Market’ knowhow across 14 Asian markets from ‘Japan to Jakarta’. He gained a wealth of experience in his career spanning across major consumer product MNCs like Procter & Gamble, Glaxo SmithKline Beecham, WIPRO, BIC. He is a strong contributor to Singapore & SEA startup ecosystem since2013, and as such, has a deep understanding of pain areas for both startups and investors. He led scaling of an F&B SaaS platform in the region that helped in its series B funding and his weekends were spent in training 150+ startup founders through a structured startup boot camp and mentored many others before he co-founded Startup-O in early 2016. A strong proponent of the ‘Pay it Forward’ philosophy, he actively shares his knowledge and experience with brave entrepreneurs and investors alike. Originally from India, he is living in Singapore with his family since 2002. Jackson represented Singapore at the EO GSEA as the National Champion, and was recognized as the top youth entrepreneur in Singapore. His Code4ASEAN program was supported by Former U.S. President Barack Obama’s Young Southeast Asian Leaders Initiatives (YSEALI). He was also one of the top 5 Venture Capitalist apprentices and was attached to Red Dot Ventures in a TV reality show – Tyro.VC. Some of his clients and partners include U.S. Department of State, NTUC and Grab. Earlier this year, Jackson became the winner of the inaugural Singapore Valley Awards (SVA), selected by prominent China entrepreneurs such as Alibaba co-founders to acquire deeper knowledge of the market and entrepreneurship in practice over at their HQ in Hangzhou China. He most recently started an e-commerce startup to help SEA merchants to enhance online distribution channels and sell effectively to China’s consumer market. Corporate wise, executive with an entrepreneurial dimension, having over 35 years of proven experience in events, technology, advertising, interactive theme parks/museums, community branding and dialogue, game creation, social apps, augmented reality, robotics, LBS and mobile applications. Felix adds a strong leaning of creative and innovative twists to technology, constantly seeking partners to expand borders. He is a certified Sales Professional for IBM Websphere and Red Hat, and has a private mandate to alleviate the healthcare burden via early detection and intervention, therapy for autism afflicted, augmented visualization of cancer, EOL choices, EEG diagnosis, and telemedicine, with a new experience ambassador portfolio. Jack is a serial entrepreneur with experiences with creating and building multiple startups. He led his previous startup to achieving half a million in revenue in its 1st year. He exited the company to build his 4th Startup, AlphaXLab. He is also Startup Mentor & Trainer at Found, ACE Startup & Founders Space. He has considerable experience with App & Web Development and mentoring startups from Local Polytechnics & Universities. He also works with multiple Blockchain/ICO projects with Startups/SMEs from Singapore, Malaysia, Indonesia, Australia, Brazil, Israel, Thailand & Korea as ICO Advisor/Blockchain Architect/CTO/Developer. He currently serve as Business Development Director at Block On Capital and CEO at AlphaXLab. Zheng Rong (zr) has extensive regional expansion and growth experience. Since launching OCBC Frank card, he has been the driving force behind Kairos Society and DBS Hotspot company Toucan. As the managing partner of Merkle Tree Ventures, he has deep experiences and networks in the blockchain industry. Having been part of multiple blockchain projects he has comprehensive insights and industrial movements in the space. He graduated from a Double Master Degree in the top #6 school of France & Spain (1 master in International Management and second one in Marketing & Sales). 5 years of experience as an account manager and sales manager in IT SaaS Solution with Oracle (Ireland) & online advertising with Criteo (Barcelona). Sales & Business process Advisor of several ICO in 2017 (Entry Money + Unchainet). 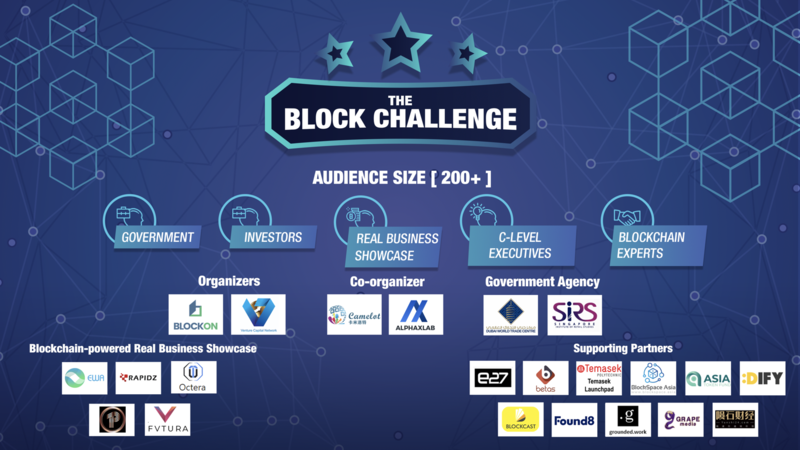 $100K Startup Challenge is co-organised by Dsion, Block On Capital, Founders Space, Found, Block Ventures, AlphaXLab & SBM. Dsion is a blockchain based investment platform that opens the door for safe and secure investments in startups using collective intelligence. For the mission of finding promising startups, Dsion Startup Challenges are held in various regions including Philippines and Singapore. Block On Capital is Singapore-based Investment firm that invest in deep technology, blockchain & fintech. Block On Portfolio includes both traditional tech & blockchain tech companies. FTAG, one of the Block On Portfolio Companies, partners with Founders Space and heading Singapore Startup Scene by mentoring & incubating Startups in the region. Founders Space is a leading global incubator and accelerator, based in Silicon Valley. With over 50 partners in 22 countries, we’ve built an international community of startups. Our community includes unicorns such as Instagram, Mashable, Change.org, GettyImage & more. Found is a network of innovation campuses where ambitious entrepreneurs and corporates find coaching, expertise, and partners to create future-ready solutions. We are a Google partner meaning that we are the landing pad for overseas members of other Google for Startups partners, members, international mentors, Googlers and founders. We will often have the privilege of organising fireside chats, mentoring sessions and other events around their presence. Block Ventures is a blockchain advisory and investment company. 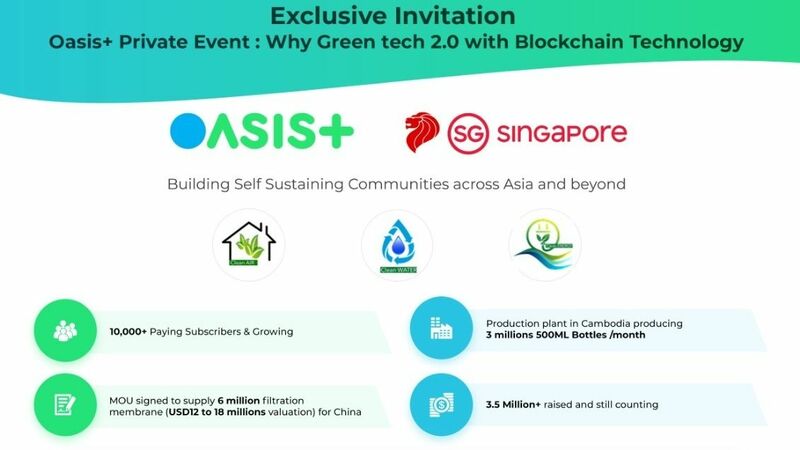 Subsidiary arm Blockchain Investment Group (BIG) is an Asian blockchain investment community that connects startup founders, thought leaders and investors across 7 countries. 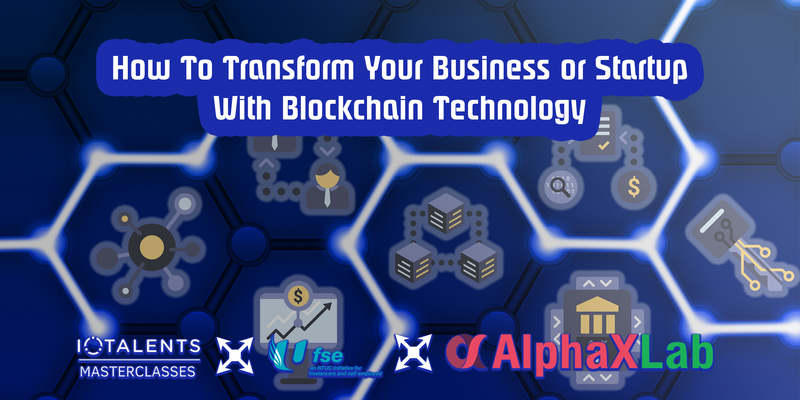 AlphaXLab Pte Ltd is Singapore-based Software Development Company founded in 2017 and provides Web/App Development, UI/UX Design, Training & Blockchain/ICO Development. The Team worked with various corporate companies such as Keppel, IRAS, NTUC, Found, ACE startup, Founders Space, BCoin, Digifinex & Block On. It also provide startup mentor-ship to startups from polytechnics & universities and also advice startups from oversea such as Malaysia, Indonesia, Thailand, Australia, Brazil & Israel. SBM.asia is one of Singapore’s largest entrepreneurial themed business networking group founded since 2002 and have held over 300 business networking and startups pitching events for 5000+ entrepreneurs.